The Hy Glo & Frank M. Whiting lighter was made in the early 1930s. Hy Glo Products Co. Owosso, Michigan U.S.A. provided only the small sterling wick lighter insert marked: Hy Glo MADE IN U.S.A. Hy Glo went out of the lighter business in 1949 due to a fire that destroyed the whole factory complex. Worth to know is that the Frank M. Whiting was founded in 1878 in North Attleboro, Massachusetts by the son of William Whiting, the founder of the Whiting Manufacturing. In 1895, the company was converted to a stock company under the name F. M. WHITING & Co. In 1896, the firm's name was changed to FRANK. M. WHITING & Co. In 1897 the company was incorporated and later in the 1924 was purchased by the Elmore Silver Company of Meriden, CT. Their line included sterling silver flatware, hollowware, novelties, souvenir spoons, etc. The brand was on the market till 1940. 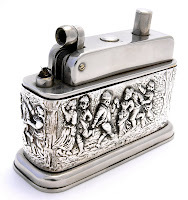 This extremely rare table lighter was manufactured by KULLANDER SILVERSMEDEN TORE in 1954 in BORĹS, Sweden. The company prospered from 1938 to 1976. 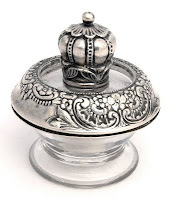 It manufactured sterling and silver-plated flatware and hollowware mainly for the Swedish market.The base of the lighter is made of silver – probably 830 grade of silver. It is weighted and marked. The lighter has a round base and feels very robust. The lighter insert was provided by Evans (USA). It is made of brass and is silver electroplated. 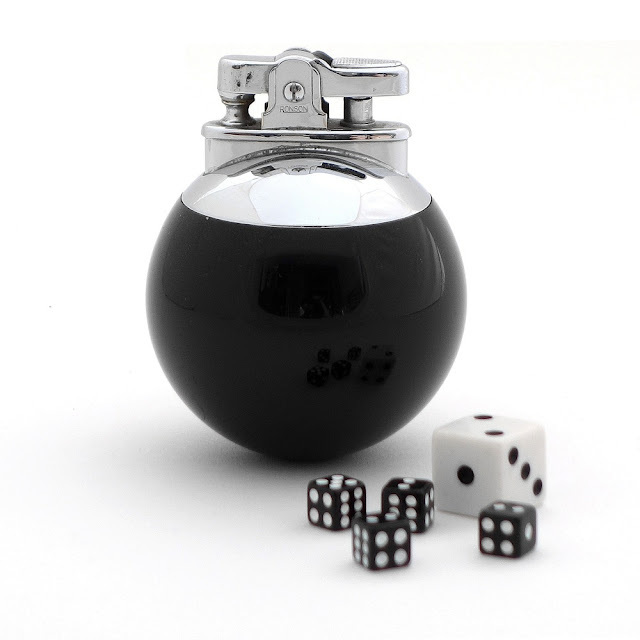 The Witchball table lighter was made by Tiffany &amp; Co. between 1956 and 1958 in London, England. This figural wick lighter presents a witch ball which have been very popular since the 18th century in England. Witch balls appeared later in the 19th century in other European countries as well as in America. The function of witch balls was to ward off evil spirits, witch's spells or ill fortune. Witch balls integrated with lighters were quite popular in the 1950s. 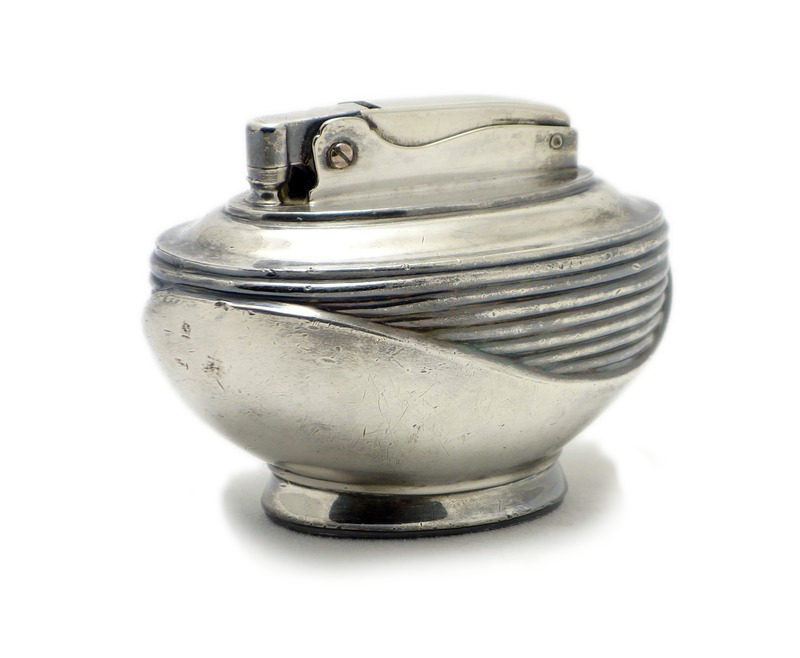 Very alike to the Tiffany's lighter is the Witchball manufactured by Richard Comyns (silverware, active since 1920 in London) in cooperation with the British lighter manufacturer - Rolstar. This post was published owing to Charlotte. Thank you! The Ronson Jubilee Set was manufactured only in 1954 in the industrial works in Newark (N.J., United States). The set consists of a lighter and a matching cigarette holder. Both are made of sterling silver and have weighted bases. The lighter has a removable Ronson Essex fitment. It is silver-plated. The KW type 650 G was first manufactured by Karl Wieden (KW) in 1935 in Germany. The production of this type ceased in 1953. 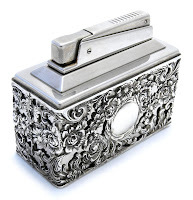 It was a very successful and robust semi-automatic table lighter produced in various finishes. The pictures on the right presents an example of the KW 650 G. Its body is covered with a thin layer of black paint in which a picture of a horse is scratched out. The KW 650 G was available also in other finishes: silver, silver plate and gold plate. The removable lighter insert is a standard nickel plate KW in normal size. There were also available smaller units in the size 3/4 and 1/2 of the normal KW (see dimensions). 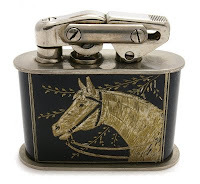 This Capri table lighter was first manufactured by Karl Wieden (KW) in 1958 in Germany. The production ceased in the early 1960s. It was one of the first gas (butane) lighters made by KW. It had a very simplistic angular design. 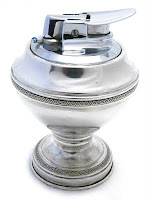 This automatic table lighter was available in different finishes: silver, nickel plated etc. The picture on the right shows a KW Capri in a rectangle openwork base in floral design. On both sides a monogram shield was present (see picture). 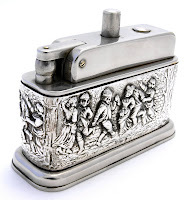 The base of the lighter was made of 800 grade of silver. The base is not weighted. Marked on the side: 800 H.
The removable lighter insert is a standard nickel plate KW Capri. This beautiful and massive semi-automatic table lighter with 'on' and 'off' buttons (look pictures below) was manufactured by Bruchhaus & Baltrusch (BeBe) between 1947 and 1951 in Germany. It is made of brass and is nickel plated. The bas-relief is made of silver and marked on the side with German hallmarks and the silver purity mark 800. The sleeve is depicting a scene of a wedding party. 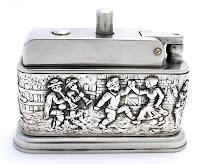 This table lighter remains some of the Mylflam models with silver sleeves depicting among others tavern or fest scenes. The BeBe 100 was also seen in other finishes: fully nickeled and enameled. The Ronson Varaflame Victoria was manufactured in W. Germany in 1964. 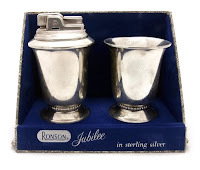 It is the only Ronson table lighter made of solid silver (800) next to the Jubilee Set (925, sterling). The removable lighter insert – the Varaflame – is partly chromium-plated and silver-plated. It has a fingertip flame control finished with a blue Swarovski crystal. Marked on the underside: Ronson (R) MADE IN W. GERMANY PATENTED. 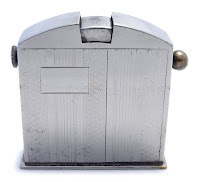 This table lighter was made by Albert Bodemer Silberwarenfabrik GmbH (known as ALBO or AB) in cooperation with Augusta Zünder between 1956 and 1962 in Germany. The Albert Bodemer Silberwarenfabrik GmbH was a typical hollowware manufacturer established in the 1940's in Keltern-Ellmendingen, Germany. It is still active today and run by the daughter of Albert Bodemer who invented all the patterns and forms. The lighter inserts were provided by several German lighter manufacturers, like KW or Augusta Zünder - today only the BIC company is their supplier (butane lighters). The rounded openwork base stands on three decorative legs. The silver basket has a floral design accompanied by two angels and a field for a monogram in the middle. 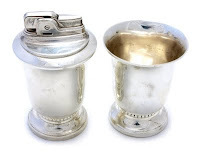 The base of the lighter was made of silver in different purities: 800, 835 and 925 grade of silver. The base is not weighted. Marked on the side: ALBO. The lighter insert was provided by Augusta Zünder, a known German supplier. It is made of brass and is silver-plated. The picture above presents a petrol (wick) lighter. 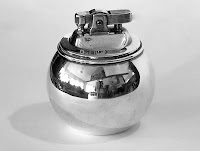 A butane gas lighter in the same shape was introduced in the early 1960s. 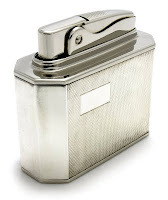 The Ronson Jr. table lighter was first manufactured in 1929. Till 1935/1936 the Rondelight was produced with the Old Standard fitment only in Newark (USA). In 1936 the New Standard fitment was introduced (see picture) and the production went on till 1939 both in USA and United Kingdom. 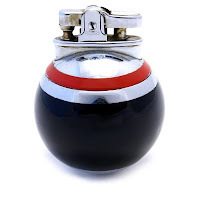 This table lighter is in the shape of a billiard ball and it was made in various finishes: plain chromium plate, covered with brown leather or chrome and enamel in six color combinations (lower part/stripe): black/red, black/black, black/blue, black/green, lavender/white and white/green. US. PAT. RE. No. 19,023 CANADA PATS. The Rowenta Bridge (catalog model: F4515 17/2, see picture) was manufactured in 1954 in Offenbach am Main, Germany. The production ceased short after that in 1957. The Rowenta Bridge was a very successful model manufactured in more than 30 different finishes, like: sterling silver, chromium plate, morocco leather and even nacre finish (mother of pearl). silver plate combined with satin silver plate (see picture on the bottom). This table lighter was based on the Adonis fitment. The base is padded with green or black felt. Only the silver plate finish is protected by a transparent lacquer. The model K 35 was manufactured by Karl Schieder Metalwarenfabrik (Kaschie) between 1936 and 1940 in Nürnberg, Germany. It is made of brass and is nickel plated. There are many different finishes of this model – mostly in enamel and machine engraved (see picture). To make the lighter work one must push down the ball switch on the right – then the top opens and the lighter lights.